Stay updated with our latest news right here on our blog. Since we have launched our feedback survey back in September we’ve received a lot of great input from our users. We’re really happy to hear from you and are now working on implementing the suggestions you have given us. Today we’re starting off with graph loading time improvements. We’ve improved caching throughout our systems and have further optimised our codebase to display the main player graph faster than ever. In our internal benchmarks, we have seen significant improvements on consecutive graph loading speeds. In some cases the graph will display over 100x faster than before. We’re really excited to be pushing this update out to all our users today. We hope you enjoy viewing your player graphs at new lighting speeds on Minetrends and stay tuned for future updates from us! We’re always looking for ways to improve the services we offer and that starts with feedback from our users. 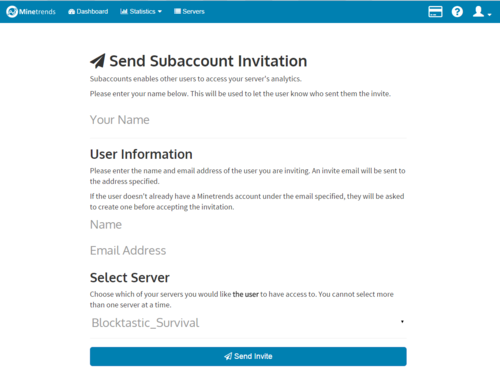 To better understand our users we have created a feedback survey. Completing it gives you a chance to win 2 months of the Pro Plan! If you’re interested in helping us improve Minetrends and would like a chance to win 2 months of the Pro Plan, take the survey here! We have improved the viewing options on the right side of the graph to make it easier to view statistics from different time periods! Below you can see the “Hour” dropdown being expanded with more options displayed. 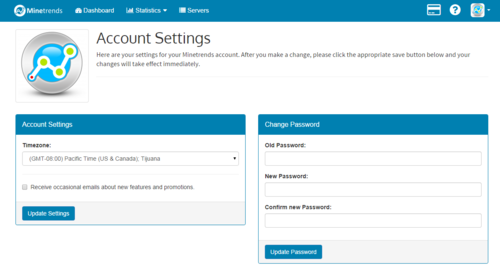 We have improved the UI and functionality of the add servers and account settings page. Below are some pictures of the improvements.